Glow discharge plasma coating systems for making plastic, beryllium, carbon, silicon, gold, or glass capsules. Composite, multi-layered, and double- shelled capsules are possible, as well. Coating systems for depositing custom layers, such as copper or germanium, or silicon dopant layers used as x-ray preheat shields. For ICF targets, custom layering also includes the option to add small amounts of detector material at specific locations in the capsule to trace capsule material mixing into the central hotspot region. Figure 7-2. Samples of some of the targets fabricated by General Atomics/NIF and fielded at NIF. Foam fabrication: polystyrene, aerogel, nanoporous metals, divinyl benzene, doping with embedded objects, etc. Facility capable of safely handling beryllium, equipped with beryllium sputter coating systems used in fabrication of beryllium shells. 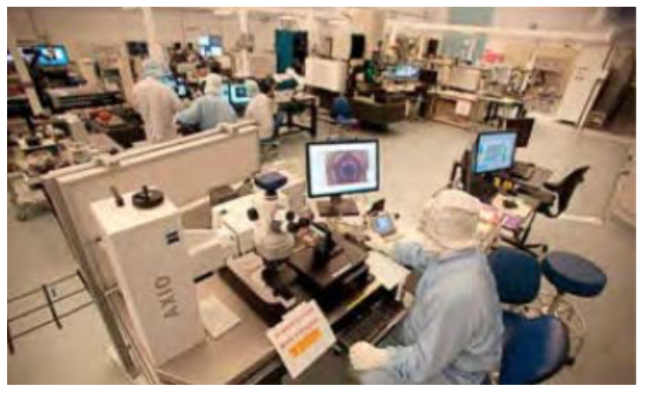 Precision target assembly is carried out at LLNL in a 3000-square-foot, Class 100 cleanroom (see Figure 7-3). The cleanroom is equipped with over 40 assembly stations with customized tooling, where components arriving from GA, in-house fabrication facilities, and outside vendors are inspected, assembled, and tested to produce shot-ready targets for NIF. A suite of new assembly tools provides increased throughput with greater repeatability, while offering agility in accommodating varying size scales and novel target features. In particular, LLNL has introduced a precision robotic assembly machine that can manipulate tiny fusion target components with unprecedented precision in an operating arena the size of a sugar cube. For cryogenic targets, LLNL also has processes and equipment in place to support deterministic layer formation and cryogenic target handling. The Livermore team has distilled a process that maximizes the probability of growing a layer from a single seed crystal. Before an experiment begins, a target is mounted on the end of the cryogenic target positioner, which sits in a large vacuum vessel just outside the NIF target chamber. There, a sophisticated system fills the capsule with fuel, characterizes the cryogenic fuel layer, and maintains the layer quality. The entire target package is kept below 20 K and is sheltered by shrouds while the layer is formed. The package is then positioned and aligned at the center of the target chamber in preparation for the experiment. Figure 7-3 (Right). Cleanroom at LLNL for target assembly and characterization. For more information on target manufacturing capabilities, visit the GA target catalog: http://www.ga.com/Websites/ga/images/products/energy/pdf/2018-IFT-Catalog-0718.pdf.